This romantic wedding photograph was taken in the historical section of Stony Brook Village in Suffolk County on Long Island, New York. After the intimate wedding ceremony at St. Philip and James RC Church in St. James, NY we traveled over to Stony Brook for pictures with the bride and groom, their families and the maid of honor and best man. This beautiful spot is a difficult place to work at on a clear day as it is located in full sun which causes subjects to squint and creates harsh shadows on faces...not the ideal scenario for great portraiture. Mother Nature teased us by having the sun poke through the clouds and then hide behind them again repeatedly. 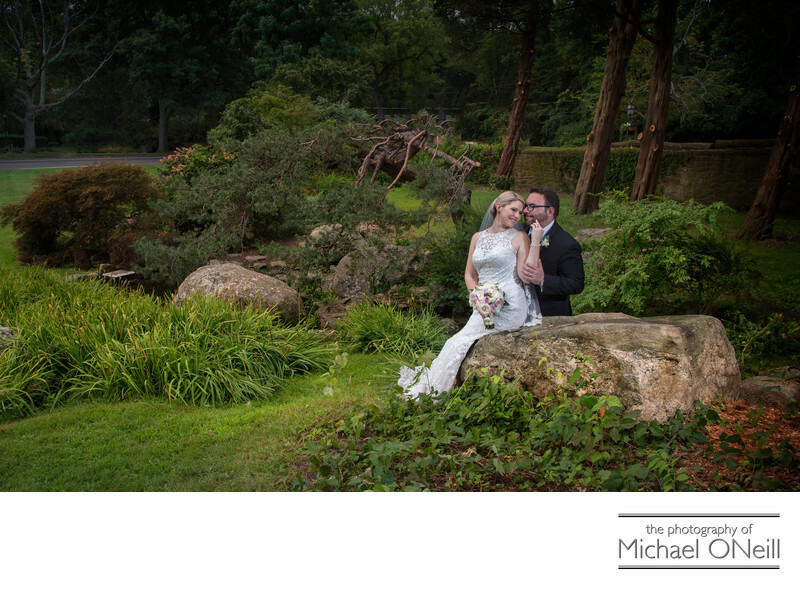 When the sun was hidden behind the clouds we were able to create this image in the soft, diffused light. The directional light on the bride and groom is coming from an off camera flash unit being held by my skilled photographic assistant. We had to work quickly in the constantly changing light. I always tell my clients that I wish them beautiful weather on their wedding day but I want a short period of overcast skies under which to make their environmental wedding pictures. A great wedding photographer should be prepared for any conditions when they set out to photograph a wedding and will be able to create beautiful pictures under any and all conditions. By working as a team with their assistant they can create exactly the right light at any location.